Time: Every Thursday, 7-9 p.m.
We sing every Thursday, 50 Thursdays of the year, except for Thanksgiving Day and special circumstances. split-session singings (Sacred Harp 7-8 pm; Shenandoah Harmony 8-9 pm). New singers -- it's a good idea to telephone or contact by e-mail in advance. If so desired, some of us will arrive early (6:30 pm) and help you get oriented. Once singing starts at 7:00 pm, we keep conversation to a minimum. .
for step-by-step introduction: Santa Monica Learner's Group. Surprisingly useful German site: "Sacred Harp ist a capella Heavy Metal"
My phone number and nonsnailmail are given below. Table of contents: Site map. The church occupies the block from Franklin Avenue to Farragut Drive. 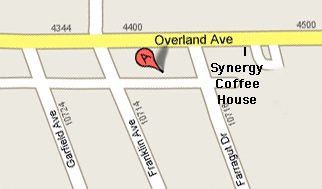 "The Spot" coffee house (formerly Synergy, before that, Cubby's) is on the next block. (some residents are vigilant, so don't take chances). Parking on Franklin north of the church is okay. Church Map: Room location in red. Church (sanctuary) itself on left; connecting building has choir room (not us). We sing in the basement of the parish hall at the right. Enter parish hall from Overland Avenue door (other door locked), go down two short flights of steps. Good acoustics for small group of singers. Remember not to park on street next to the singing room. What to expect. Favorite song management.